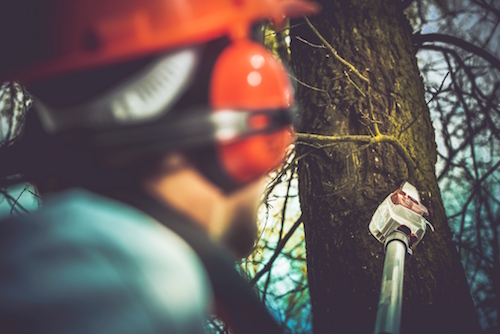 5 Times You Should Reach Out to an Oregon Arborist | Mr. Tree, Inc. Maintaining trees on your property is one of the most worthwhile, rewarding things you can do as a homeowner. Throughout the year, they’ll provide curb appeal, shade, fresh air, and a place for birds to live and children to play. However, trees don’t come without challenges of their own. Even at the best of times, trees require a great deal of care and occasionally they need emergency care that can be beyond the scope of anyone without the requisite training. While it’s certainly a good idea to educate yourself on the particulars of tree care, the fact remains that sometimes you’ll need to reach out to an Oregon arborist, such as the experts at Mr. Tree. Like any living thing, a tree needs regular care to stay in optimal health. This means that the branches of your tree will occasionally need to be pruned. This can also be an issue of safety, especially if you have taller trees. If a tree limb or large branch weakens or dies, it can break off and fall to the ground, potentially injuring someone or damaging property. It’s a good idea to have at-risk limbs removed well before they pose a serious threat. For safety reasons, tree trimming is definitely something you will want to approach a professional Oregon arborist for. They are trained to climb into the tree without damaging it and remove limbs and branches without posing a risk to the surrounding area. They know how to work around other potential hazards, such as electrical cables, and they’ll bring the specialized equipment that’s needed to do the job effectively. Trimming your tree for health is a necessity, but caring for your tree also includes its cosmetic appearance. Having a tree is one of the top ways you can boost curb appeal of your home, but you have to keep it looking its best. A trained arborist can keep your tree at the size and shape you prefer; if you want a smaller tree, your arborist can handle that. If you want your tree to be cut into a specific shape, your arborist can do that as well. Over time, trees can be trained to maintain the shape that you want, but they have to be trimmed regularly by a specialist; if you have fruit trees, pruning can also help your tree bear the most amount of fruit possible. There are a wide variety of diseases that can affect trees, usually depending on the species and the time of year. There are different degrees of severity to these diseases, with some merely affecting the cosmetic appearance of your tree and others seriously weakening or even killing it. Diseases can also have a variety of causes, from dehydration to insects to bacteria to fungi. As a tree owner, you will need to learn to recognize the signs of disease and periodically get your arborist in to do a more comprehensive exam of the health of your tree. If you notice the leaves drooping, or changing color out of season, this could be a sign of sickness. Similarly, if the leaves have black spots or white spots, or there are holes in the bark, any of these could be signs of disease as well. If you believe your tree has been afflicted by sickness, contact your arborist as soon as possible. Your local specialist will then come and perform a thorough examination, determining what, if any, illness your tree has and what steps to take to treat it. In many cases, a simple pruning can handle the problem. However, sometimes more in-depth treatment will be required, such as the application of topical chemicals or the removal of larger parts of the tree. While adult trees are hardy and can stand up to many different weather conditions, saplings need constant care and attention until they grow strong roots. It’s important to the survival of your tree for it to be cared for from the moment it goes into the soil, and a good Oregon arborist can help you do just that. These specialists can help you choose the right tree species for your area, soil, and climate, and often perform the planting for you. Then they will check on the tree regularly, making sure it’s getting enough nutrients and water. While adult trees don’t normally need to be watered, saplings should receive regular deep watering in order to transport nutrients and prevent diseases. They’ll also put down mulch to help conserve moisture as the tree grows. They’ll regularly inspect your sapling to check for signs of illness or insect infestation and ensure your new tree is growing strong roots. Perhaps one of the most daunting challenges that tree owners face is the removal of old, sick, or dead trees. This is a process that has to be handled with the utmost care as the whole tree will have to be removed in parts. If it is not handled safely, then there is a significant risk posed to life, limb, and property. A professional arborist will bring in the proper equipment and manpower to get the job done safely and effectively. When removing a tree, a lot of debris and material can be left behind, and a skilled Oregon arborist can get it off of your property to be mulched and recycled at no hassle to you. The other big part of the handling of a dead tree is the removal of the stump; after the tree has been cut down, the stump will still stand and the roots may still be deep underneath the earth. These old roots can interfere with the planting of other trees, not to mention water pipes and other underground parts of your home. Your professional arborist will bring the heavy-duty equipment needed to remove an old tree stump.